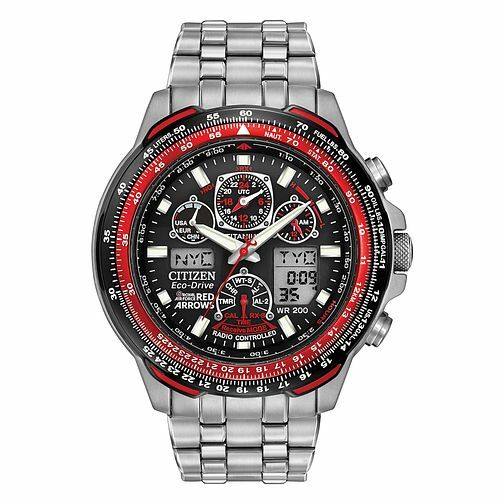 Citizen Eco-Drive Red Arrow Skyhawk men' watch, with titanium bracelet. Featuring a large black round dial, red trim, tachymeter digital function and chronograph. This watch also has alarm functionality. 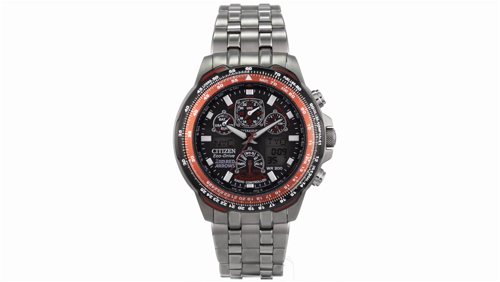 Citizen Eco-Drive Men's Red Arrow Skyhawk Watch is rated 5.0 out of 5 by 9. Rated 5 out of 5 by Anonymous from Really good watch The watch is good to look at and has plenty of useful features, the only thing I don't like is the strap it's either too tight or too loose so I'm going to buy a different strap and fit it. Rated 5 out of 5 by Anonymous from Fantastic! I got this time piece for my husband to mark his birthday and our anniversary... it’s a time piece he’s always dreamed of having, so this was such a pleasant surprise.